A block of flats, built circa 1955, for the Bangor Provident Trust. They had been in the course of modernisation for sale but, given the special circumstances, it seems unlikely that the work will re-start soon. The following planning permission (14 December 2017) applies “LA06/2017/0805/F Refurbishment of 12 no. existing apartments including addition of front (sea view) dormers, rear dormers, removal of existing chimneys, change from hipped roof to gable peaks, red brick walls to be rendered (off-white render), new external ramp and existing balconies to be enclosed. (Amended proposal) 150 - 160 Seacliff Road Bangor Co.Down BT20 5HA”. See also J5180 : Vacant social housing, Bangor (July 2015). 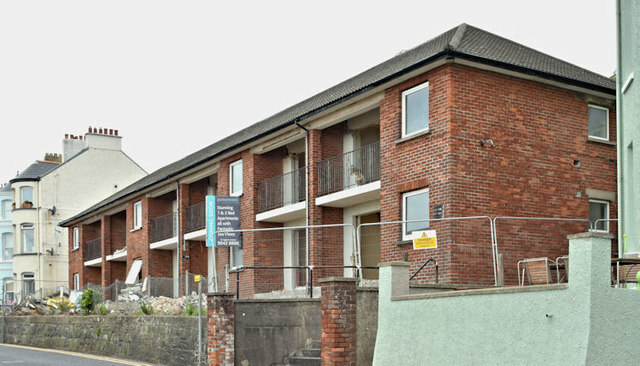 For a later view, after redevelopment, see J5082 : The Seacliff Road, Bangor.